Do you ever get that thing where when you have no money you see loads of things you want to buy but when you've been paid and have a shopping itch you can't find anything? Well I've got that right now. I'm talking clothes shopping - I can always find ways to blow my cash on shoes, accessories and make-up. I think it has a bit to do with the crap weather - I'm not so sure what I actually want to buy - and also because there are a lot of summer clothes that I would never buy for my shape such as strapless / sleeveless stuff, so that can rule out a lot. Anyway, tired of being unable to find something I like after trawling online, I thought I'd have a little window shopping on french connection. Why is all the pretty stuff sooooo expensive? Boo. First up, I'd actually be tempted to buy this, it's my sort of dress. The sleeves are a bit lacking though. At £60 it's quite reasonable for French Connection. Not something I'd wear (no sleeves) but I like the detail on the bust. £75. 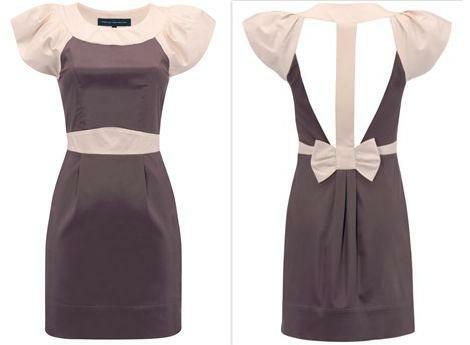 This is a dress that already caught my eye in a magazine or maybe online as it's already been worn by a few celebs. It comes in some candy shades too - pink, yellow, pale blue and I think white. I really like the sleeves although the neckline is much higher than I'd normally wear / than is flattering on most people. I don't know why I'm pondering these facts as at £115 I'm not about to pop out and buy one in each colour. Pretty as this pink one is, it reminds me of a kaftan for the beach, a £135 kaftan! It seems to be the new season version of the popular Bex dress last year and there are two versions.